James Albert Ukawsaw Gronniosaw was the first published black author in Britain. 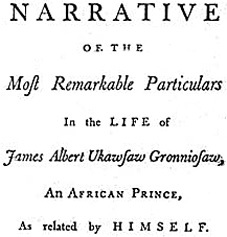 His autobiography, A Narrative of the Most Remarkable Particulars in the Life of James Albert Ukawsaw Gronniosaw, An African Prince, appeared in Bath in 1772, and went through at least nine editions by 1811. Almost everything we know about Gronniosaw comes from his autobiography. Born in Bornu (modern-day Nigeria) around 1710, Gronniosaw was a precocious child with a natural propensity towards monotheistic religiosity, ‘it being strongly impressed on my mind that there was some Great Man of power which resided above the sun, moon and stars, the objects of our worship.’ This impression alienated the young Gronniosaw from his parents and friends, and when some traders arrived in his village and offered to take him to the Gold Coast, where he would ‘see houses with wings to them walk upon the water, and should also see the white folks’, he jumped at the chance. The traders tricked him, and he was sold into slavery upon arrival at the Gold Coast. Gronniosaw was bought by a Dutch ship’s captain and taken to Barbados, where he was sold firstly to a man from New York named Vanhorn, and then in turn to Theodore Frelinghuysen, an influential minister and friend of the evangelical preacher George Whitefield. Frelinghuysen saw that Gronniosaw received a religious education, and Mrs. Frelinghuysen introduced him to spiritual works by John Bunyan and Richard Baxter. Gronniosaw became a free man upon his master’s death in 1747, but he continued to live with the family, serving Frelinghuysen’s wife and children. However, they all died within four years, and Gronniosaw decided to go to England to seek out Whitefield, who had been kind to him during his enslavement. However, we do know that Gronniosaw made some money from the sale of his Narrative. The Calvinist socialite Selina Hastings, Countess of Huntingdon, paid for the production and dissemination of the text, and Gronniosaw’s family had ‘the sole Profits arising from the Sale of it’. While Gronniosaw was not overtly critical of the slave trade in his Narrative, and many black authors were to be more radical in their condemnation of the traffic, Gronniosaw draws attention to the prejudice experienced by black people in Britain during the eighteenth century. The Narrative is the earliest known example of a black person telling his life story, published long before slavery became an issue for national debate. Before Gronniosaw, the British reading public had no first-hand account of the spiritual lives of slaves, or indeed the suffering they endured under transatlantic slavery. Ryan Hanley is researching towards a PhD in slave narrative at the University of Hull.